Metropolitan Grill is located in Northwest Tucson in the shopping center on the southeast corner of Oracle and Magee Roads. Metro grill Tucson is a locally owned and popular Tucson restaurant. The Metropolitan Grill is open every day for lunch and dinner. It is a ideal place for a business lunch or evening out. Located just south of Oro Valley, it is within easy access of most of Northwest Tucson. Even thought this restaurant has closed, don’t cry! There are other great dining spots to choose from – Find one here! Meals at the Metropolitan Grill are excellent. They have a varying menu which includes seafood, poultry, pasta and meat dishes. The Metro Grill menu also offers a big selection of entree salads and specialty sandwiches. Although dinner has a slightly more formal menu it is basically the same menu. The Metropolitan Grill serves just good American Food. The Met Grill ambiance is relaxed and very comfortable. With an easy to get to location the Metro Grill is popular for early evening dining. There are also a variety of early bird specials for food and drinks. Patrons at the Metropolitan Grill will notice the work of local Tucson artists throughout the restaurant. From at the entrance to the mural in the bar. One interesting art piece is the American Flag imaginatively made from broken dishes. Using local artists skillfully brought to the America’s Kitchen theme. The Metropolitan Grill kitchen is open to the dining area. Customers can watch meals being prepared on the wood fired pizza oven and an open rotisserie. Happy hour at the Metropolitan Grill is in the bar and runs from 3pm to close seven day a week. The entire Appetizer Menu is 1/2 price and $1 off all Drinks and Pizzas. You will find an variety of Micro Brewery beers on hand from various locations including Arizona, California, Colorado and Hawaii. With four large HDTV’s in the bar the Metropolitan Grill Tucson is a great spot to watch a sporting event. 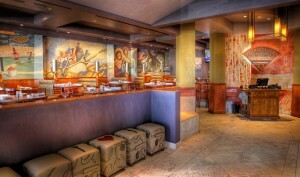 Metro Grill Tucson also has private dining for special occasions and parties. The Boardroom will seat 20 guests and up to 65 people can be accommodated in the Banquet Room. With fantastic Prices, good Atmosphere and convenient location The Metropolitan Grill is a perfect spot for Oro Valley AZ and Northwest Tucson residents and visitors.